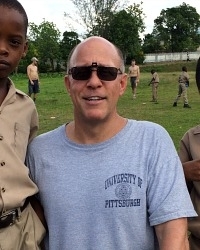 January 15, 2018 – Led by Alumni Philanthropy Chair Cal Fastuca ’78, eight DUs spent a week in Jamaica over winter break working at an elementary school. 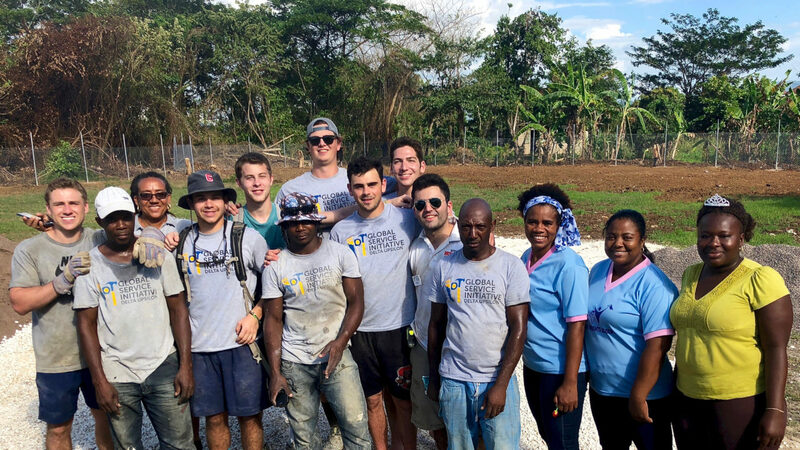 With nine participants, the Cornell cohort was the largest of the eight DU chapters participating in the Delta Upsilon International mission. “We worked at the Church Hill Primary School, an elementary school in a very poor and rural part of Jamaica,” Cal Fastuca (on right) said. “The boys built a new netball playground and painted three classrooms and played with the elementary students at lunchtime. “There was an incredible bond established between the 25 college students and the young elementary students. The entire school, including principal, teachers, and students, had a ceremony for DU at the end to express their appreciation – it was a real tear jerker,” Cal said. A special thank you to Duane Phillips ’78 and Tony Cashen ’57 for helping fund part of the trip. A total of 27 DUs from these chapters participated: Kansas State, Lafayette, Oklahoma, Rutgers, Michigan Tech, Ohio State and Iowa State. The trip was organized by DUI’s Kaye Schendel, Director of Global Service Initiatives, and Colin Finn.